The crowds file in, clogging the lobbies and escalators. They peer and gawk. They shuffle around with phone cameras cocked. It’s always like this when any mall or major building opens. Why should you expect anything different at the new Tokyo Midtown Hibiya mall? Even when you find the restaurants, there’s little respite from the inevitable lines and incessant milling around. So it comes as a major relief to finally reach the third floor and find the imposing, polished wood portal of Sobagami. There are no windows to allow a glimpse of what lies within. This is intentional. Once you slide open that inscrutable polished timber door and slip inside, all is quiet and calm, a welcome oasis that is safely insulated from the relentless toing and froing outside. 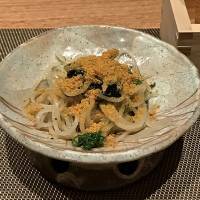 Sobagami is a soba noodle specialist — this you can guess from the name — but it is also an offshoot of the very genteel Ginza Kamiya, a high-end kappō (traditional counter-style Japanese restaurant) that takes pride in doing things the right way. Do not be surprised that the matron who greets you is dressed in a kimono and the chefs you see working the open kitchen all wear starched whites with prim neckties. 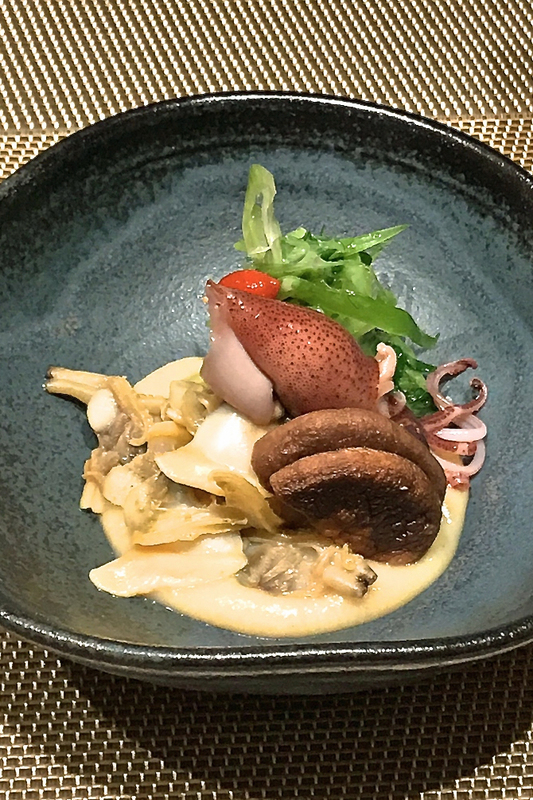 The formality eases a notch or two once they have ascertained that you can communicate on at least a basic level and are comfortable with the fact they only serve fixed omakase (“leave it up to the chef”) menus. Once you have made your choice you need only sit back and wait for your meal to arrive. At midday, this can be as simple as a tray of their freshly made soba, preceded by a few small nibbles. But if you have the time and wherewithal, it’s worth treating yourself to a more extended meal. Lasting a leisurely hour or so, it will include a series of seasonal dishes, all small but beautifully constructed, before your noodles and finally a dessert. One caveat: lunch reservations are only taken for the multicourse menus (¥5,000 and over). For the simplest noodle menu (¥2,100), it’s first-come, first-served and the line forms well before the 11:30 a.m. opening time. But it’s at dinner that Sobagami shows its true mettle. 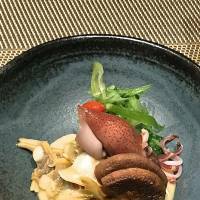 Even the shortest of the three set menus (¥5,400, ¥8,650 and ¥10,800) will be a miniature tour of the flavors and colors of the season. 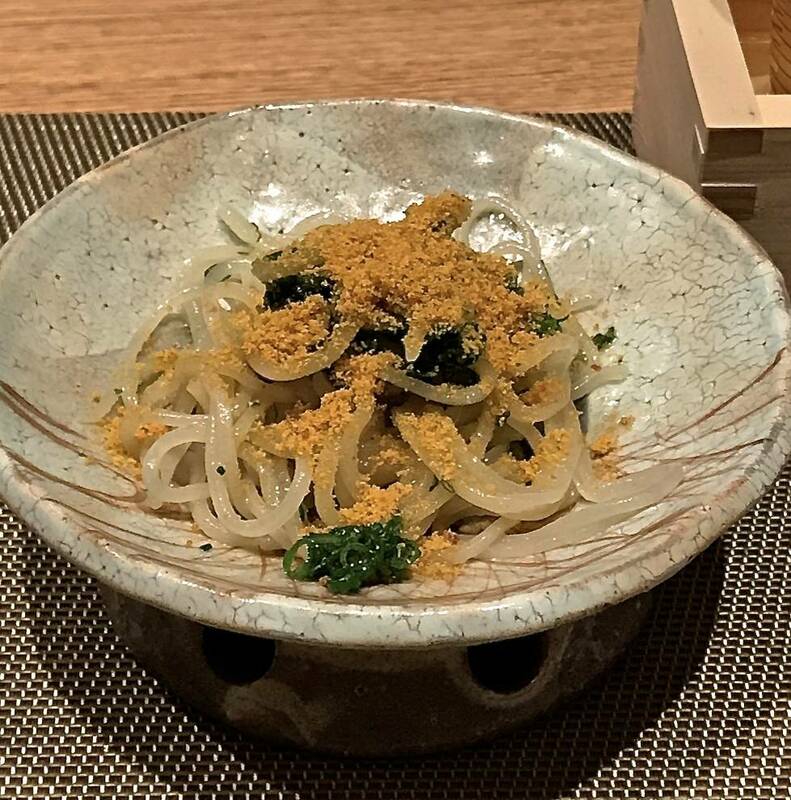 Dishes of late spring are likely to include hotaru-ika (firefly squid) from Toyama Bay paired with asari nuta, clams in a delicately vinegared white miso dressing; and takenoko (bamboo shoots) served with wakame seaweed and red sea bream roe, topped with a sprig of aromatic kinome (sanshō pepper leaf). There will also be a tempura course. The noodles are good, although the servings are small. Two kinds are prepared each day — one a delicate, thin, light-colored noodle; the other a chunkier, darker inaka (country-style) soba that is heartier and more filling. The meal closes with a sorbet — and then, before you know it, you are out among the throng again. 11:30 a.m.-2 p.m., 5:30 a.m.-9 p.m.